Engagement and culture were big buzzwords in 2015, and here at Inflow, we wanted to do what we could to ensure that we have a place where our team can thrive together. But how do you measure someone’s engagement? We’re not bots with data you can measure. I love data. I love analyzing it. But as much as many of us want black and white data to make and drive business and personnel decisions, human beings just aren’t wired that way. So how does a leader gauge a staff member’s engagement? We have several tools we use to get continual staff feedback and gauge the culture. We use 15Five for weekly communication with staff and RoundPegg to get a better understanding of our culture, what the staff wants and what motivates each individual person. The best aspect of RoundPegg is that it not only provides leadership with insight to how each of us works best, but it provides data on all staff members who participated in aggregate, broken down by teams, departments and individuals. The screenshot below is from our internal marketing department’s “Core Values” report in RoundPegg. As you can see, Everett and Sara don’t care for aggressive competitiveness. They prefer a supportive environment where they can exercise creativity in a well-defined role. RoundPegg puts everyone who takes the survey into four culture types: Command, Competence, Cultivate, and Collaborate. There is no judgment assigned to any culture type. It simply assesses how an employee sees themselves and what they value in a work environment. We have staff in all four categories, with the majority being highly Collaborative. Once the initial survey is completed, you can see the culture type you prefer and how you are likely to work with the remaining three types. For me, I prefer a culture type of Competence over 96 percent of the population, with Cultivation next at 71 percent, Collaboration at 63 percent and Command at 8 percent. This tells me that I can flex fairly easily between the first three types, but will have to work harder when I’m working with a fellow employee that prefers the Command Culture Type. 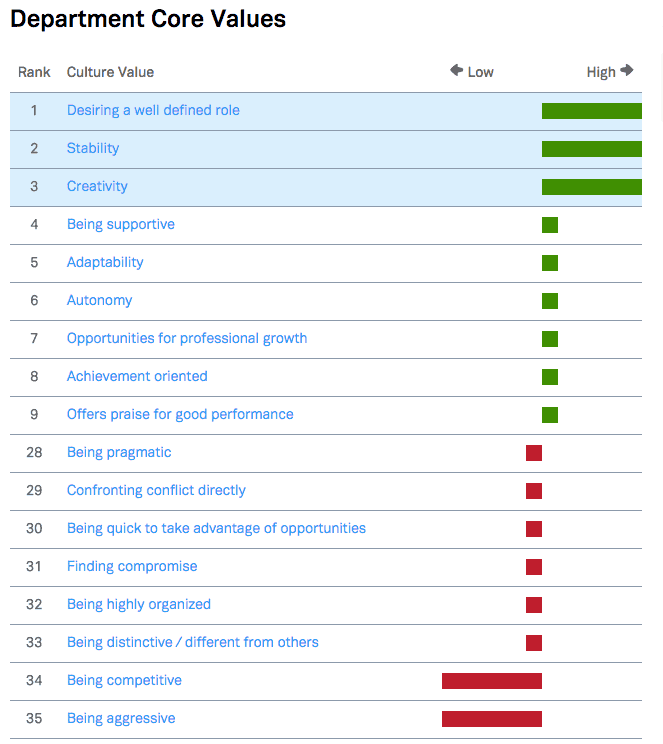 Everyone at Inflow completed the survey and were able to see each staff member’s preferred Culture Type. I was able to see the Culture Type preferred by those that I manage and I adjusted how I approached problem-solving based on the data. One of my teams had a preferred Culture Type of Collaborative across the entire team. As a direct result, I changed how I approached problem-solving to include the team in more discussions about issues. Since including them more in the discussion and problem solving, there has been a visible and tangible increase in engagement as seen through client results, willingness to step up when things get rough and a sincere commitment to the team, their clients, and the company. As we started looking at details for each of us individually, we all tried to find the staff member to which we had the highest score – the fellow staff member that was most like us. As humans, we all want to be around those that are most like us – our tribe! However, in an organization that has clients across multiple industries, countries and cultures, diversity is critical. This diversity also produces new ideas and solutions for the organization and clients. Nevertheless, working with people that approach problem solving or customer service from a different set of values from your own can be challenging and frustrating unless you understand where they are coming from. Without knowing how another person approaches a given situation or wants to be communicated with, may leave staff feeling isolated, discouraged or unsuccessful. This can lead to poor work product and ultimately to turnover – both of which can cost an organization huge amounts of money. We have staff in all four categories: 40 percent of our staff prefer a Collaborative culture, 23 percent Cultivation, 23 percent Competence and 14 percent Command. As a result, we need to be self-aware as an organization and take the time to understand what’s important to those that we’re working next to on a given project. Leadership and staff can review another person’s RoundPegg guide to learn that person’s top values and they can compare their own values to another staff member. The side-by-side not only identifies where you’re aligned but where you’re different. It explains how you both may react to these differences. It then provides you with possible ways to approach interacting with each other to maximize both of your strengths. This reduces assumptions we may make when someone responds differently than we would to a given situation and allows leaders to respond with more consideration. This is just the tip of the iceberg for the data in RoundPegg. We use it to see how departments are different as well as the teams within departments. This information can help us determine which clients to align with which teams and which teams new staff members may best fit into. Bringing new people onto the team can sometimes feel like a gamble. The new hire may have aced the technical interview and seemed like they’d fit (based on a couple hours of interviews), but you don’t really know until the honeymoon period is over. We’re starting to use our RoundPegg data to better understand how a potential hire will fit with a team, manager, and the organization. We recently had a candidate fill out a survey which returned a fit score of 29 (out of 100) to the team, and a 77 with that team’s manager. At first blush, we thought the candidate was not a good culture fit until we really dug into the data. What we realized was that we needed to verify that the diversity of this candidate would add strength to the team and not cause tension or frustration. To determine this, we needed to understand the top values of the candidate and what was different from the team’s top values. As we looked, we discovered that the candidate shared the same top three values as the team, but also brought a few additional values that were not strongly represented across the team. For example, the candidate valued being highly organized where the group didn’t place a high value there. This means the candidate could bring that skill to the team – the candidate would most likely be great for setting up new systems and putting processes into place. On the other hand, the manager for this team likes roles and responsibilities that are well-defined, whereas the candidate “prefers to have flexible and fluid responsibilities without restricting titles.” Knowing this, the manager can identify before the staff member starts what might be frustrating to them as an employee and come with strategies to address the difference between their values as a manager and the staff member. All this data is great, but it’s sometimes hard to know if the staff is being straight with you. Fortunately, the RoundPegg has a function that allows for an anonymous engagement survey to gauge how we’re doing with culture and engaging the team. For the management team, it highlights what we need to focus on in order to continue to make this a place people want to be. The results can be viewed as an entire company or by a department. The feedback from our most recent survey told us that we’re moving in the right direction with our culture, but still have a few areas to continue to work on. In addition to the RoundPegg data, the weekly 15Five reports have played a large role in keeping lines of communication open between staff and their manager. The 15Five weekly reports have helped me keep a pulse on how the staff are feeling, where they were successful or got stuck, and what they need from me or the organization. The RoundPegg data has even fed into our 15Five questions. When there is an area in the RoundPegg engagement survey that comes back with a low score, we will create a new question in 15Five to get more feedback on that particular area – especially if we’re working on putting new practices into place to improve that specific concern. These dashboards are a tool that leadership uses to provide communication back to each individual employee so that they know exactly where they stand at any given time. We don’t want to wait for the formal review process (Quarterly Conversations) to let a staff member know where they are being successful and where improvement is needed. As we get all these systems working smoothly to gauge and improve our culture, we’re also exploring how we can start to use the RoundPegg tool to better understand our clients’ values, so we can customize our communication and align our customers with the best staff for their individual needs. Christina Griggs, Inflow CFO has worked as a short-interest trader in London, England, been an investment advisor with Dean Witter (now JP Morgan), held the role as Chief Financial Officer for a successful corporate housing firm and has successfully worked with more than 200 different organizations in developing and maintaining fiscal and operational structures as a business consultant.